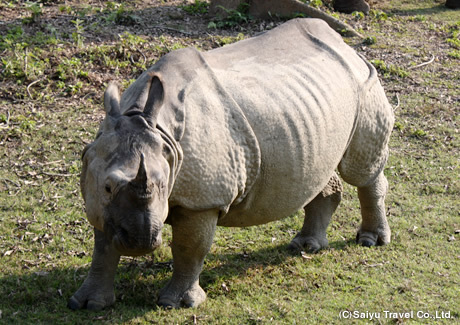 Safari Chitwan National Park 1 night 2 days tour｜Saiyu Nepal Trekking & Expedition Pvt.Ltd. 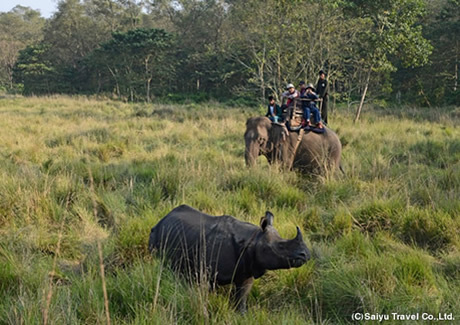 Jungle safari adventure in the first National park of Nepal. The bus departure time from Kathmandu is 7:00 in the morning. Kathmandu – Sauraha (Chitwan) is around 150km, takes 5-6 hours [may change depending upon the traffic conditions]. Meet the hotel staff at the hotel, transfer to the hotel. 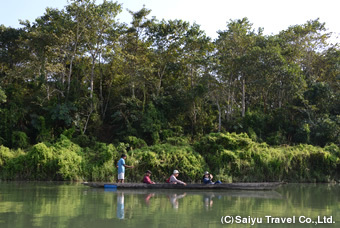 Enjoy the jungle activities in Chitwan until the departure time. 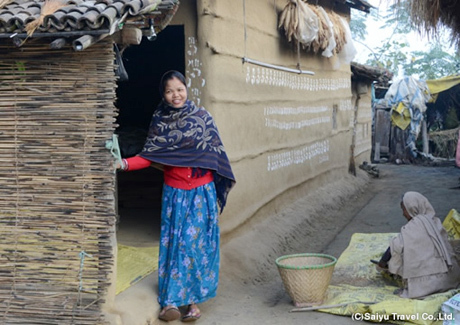 You will be dropped off to the bus station in Sauraha. The bus departure time is 9:30 in the morning. Tour ends after arrival at Kathmandu. Tourist bus fare / Nature guide of the hotel / Accommodation and service charges mentioned in the itinerary / Meals (BF 1, LN 1, DN 1) / Jungle activities in Chitwan / Other taxes, etc. Hotel – tourist bus station transport arrangements are possible with an additional cost of US$10 per vehicle. If your hotel / accommodation is located out of Kathmandu, there will be additional charges. Please contact us for the quotation. 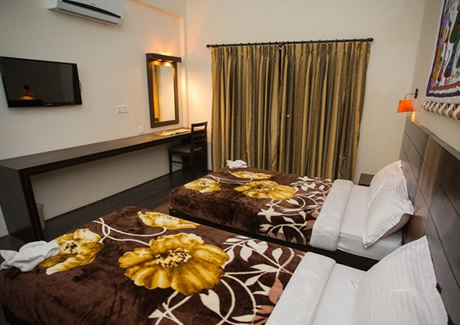 - All the jungle activities in Chitwan are managed by the hotel. The order of the activities may change. - Please be aware of possibilities of the bus getting delayed to Chitwan due to traffic conditions. All the activities may not be covered in this case. - In the Elephant Safari, 4 people will need to share one Elephant. A private Safari is possible with additional cost. Please contact us for the quotation. 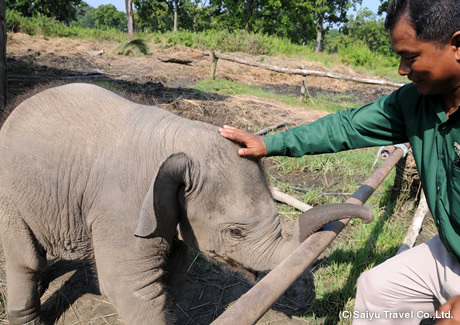 - As of July 2016, Elephants are not allowed to enter the Chitwan National Park during Safari tour. If you like to go inside the park, we would recommend a Jeep Safari. Additionally, Canoe rides are also operated in the community forest at the border of the National Park. -Please contact us for the quotation of more than 3 persons. - The price of children differ from that of an Adult. Please contact us for the quotation for child. -A private to Kathmandu / Pokhara / other citieis can be arranged. Please contact us for the quotation. -Specialized bird watching tours can be arranged in Chitwan. Please contact us for the quotation. 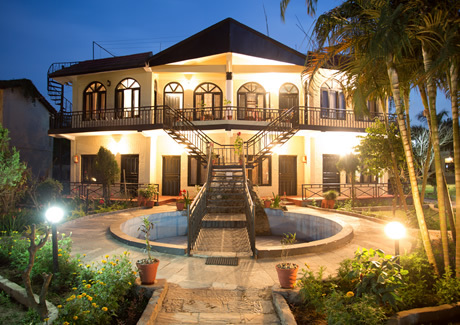 Chitwan adventure resort offers high quality safari service with clean air conditioned rooms. 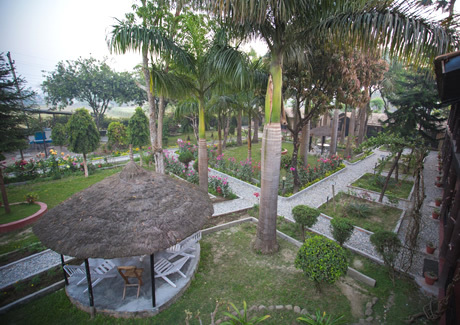 Located good at Sauraha, the popularity is increasing day by day with its spacious rooms, wide garden, beautiful exterior and delicious food. A free WI-FI service is also available. 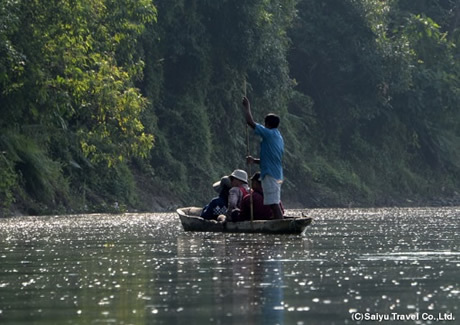 Chitwan National Park, located in plain Terai Lands of central Nepal is one of the first of its type in Nepal to get registered in the UNESCO World Heritage Site. Extending 80km from east to west and 23km from north to south, it contains a wide range of wild lives, bird species, mammals and butterflies. There are more than 43 species of mammals including the Royal Bengal Tiger, One Horned Rhinoceros, spotted deer, Leopards, Grey Langur etc. The bird species inside the park is recorded to be more than 450 types making Chitwan a hub for the bird lovers. 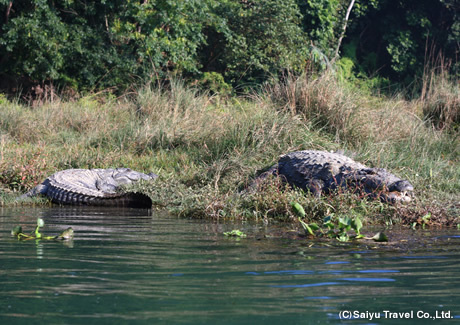 In the area, there are 43 species of mammalian such as Bengal Tiger, Indian rhinoceros (ne-horned Rhinoceros), spotted deer, Indian Leopard, and Grey Langur and more than 450 species of birds. The importance of wide range of wild species, its accessibility, services during the tourist`s stay and instinct Tharu culture have made Chitwan one of the most visited tourist destinations.